The ninth in a series of short films about some of the vehicles in our collection presented by The Tank Museum’s historian David Fletcher MBE. While the heavy tanks were designed for direct attacks against enemy trenches the Tank Corps also wanted a lighter, faster tank to work with the cavalry over open country. Designed by Sir William Tritton and built by Fosters of Lincoln the Medium A, or Whippet, was the only such tank to see service with the Tank Corps, starting in 1918. Also, here is a video of the Whippet in use. 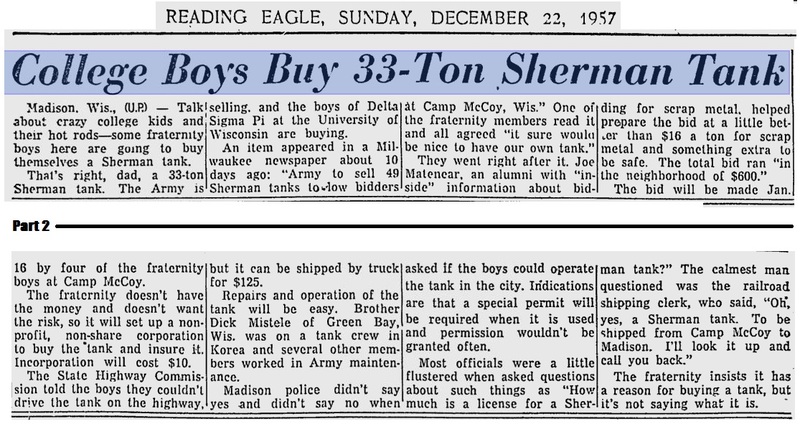 While browsing through some old newspaper articles, we stumbled across this amusing headline from the Reading Eagle, Dec 22, 1957, “College boys Buy 33-Ton Sherman Tank.” The article states that a fraternity in Madison WI, some of whom were Korean War veterans, bought the tank for approximately $600 in a scrap auction. Considering what an operational Sherman tank is worth these days (well into six figures), $600 seems like quite a good investment. At some point during the recent Tank Biathlon event in Russia a T-72B3 tank hit a concrete wall while travelling at high speed. The tank suffered serious damage, including cracks to the front hull armor plates. The Times of India has posted an article commemorating the 50th anniversary of the 1965 war between India and Pakistan with a focus on the defeat of Pakistani M48 Patton tanks by Indian forces. The brave men who had demolished Pakistan’s feared Patton tanks in 1965 are a part of village lore in Asal Uttar, Punjab. The landscape surrounding the memorial of Abdul Hamid is pretty as a picture postcard. Paddy fields sway in the easy breeze and ashen clouds play hide and seek with the sun. It’s impossible to imagine that 50 years ago the region was the theatre of one of the most intense and decisive tank battles in history. Asal Uttar and neighbouring villages — Bhura Kuhna, Chima, Amar Kot, Valtoha and Bhura Karimpur — had turned into a battleground for four days. The desperate, do-or-die battle between Pakistan and India began on September 7, 1965. By the time it was over, Pakistan’s General Ayub Khan’s dream of capturing Amritsar had turned into a nightmare. The combat zone had also become a graveyard for the feared Patton tanks. Pakistan lost 97 tanks in all, including 72 Pattons. Enough to create, for a brief while, an open-air showroom called Patton Nagar in nearby Bhikkiwind. For those interested in the armored clashes between Indian and Pakistan in the 1965 war, be sure to check out the upcoming book “M48 Patton vs Centurion: INdo-Pakistani War 1965 (Duel)” by David Higgins scheduled for a January 2016 release. During World War II, German armored reconnaissance laid the groundwork–often through small-unit actions–for the stunning tank and infantry operations that made the German military famous. 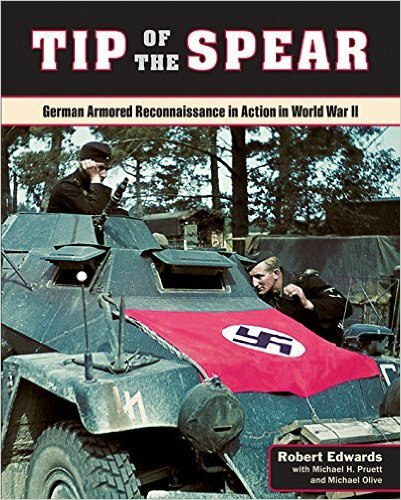 Robert Edwards’s follow-up to Scouts Out, the first extensive treatment of the subject in English, focuses on the battles and personalities found in ranks of the Waffen-SS, Luftwaffe, and other divisions. First things first, Chobham armour isn’t an accurate term, it’s like a family name for modern composites. It’s often used by the Press to describe the concept if not the exact detail to its readers, nearly all of whom couldn’t tell a Tiger from a Sherman reliably. Composite armours are nothing new. In the 1930’s Vickers designed some of its tanks with thin layers of high quality armour plate over thicker layers of much softer quality armour. Or in World War One some British tanks were tested with oak planking as backing to their steel armour. If you push back as far as the medieval period, chain mail and the padded jacket was technically a composite armour. However the post war composites were generally designed to defeat warheads, such as siliceous-core armour, which was great against HEAT warheads but was pretty useless against kinetic energy rounds. Also, be sure to check out this article that Lister links to in the piece. This is a rather amusing newspaper clip from 1980 showing how wildly inaccurate some of the criticisms of the XM-1 were at the time of it’s entry into service. It should be noted that Robert Icks, the first person quoted in the article, was one of the most knowledgeable tank experts in the US at the time this article was written.